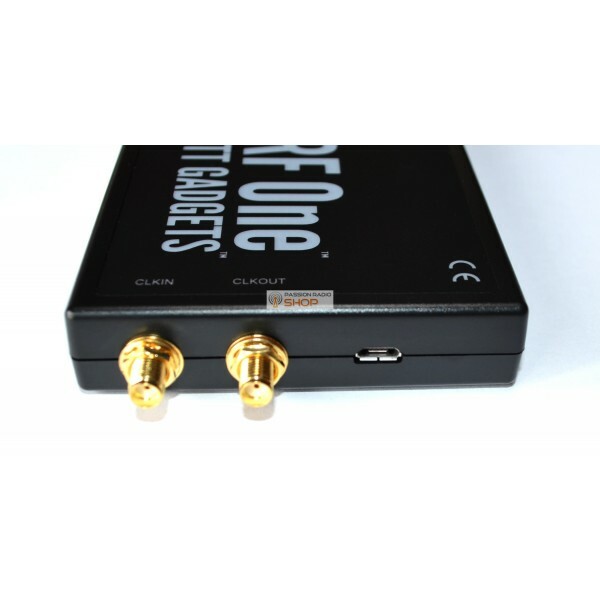 The HackRF One is a test equipment for RF related experiments which covers a frequency range from 10 to 6000 MHz. It is used for experiments with open source programs for SDRs, own software development for radio communications and experiments in amateur radio. The hardware was developed by Michael Ossmann (USA) as an open source device, backed by a strong Kickstarter funding project. It is now sold as a commercial product as well. The system covers a wide frequency range from 10 to 6000 MHz, and covers many licensed and unlicensed as well as ham radio bands. The hardware offers a maximum sample rate of 20MS/s, which is sufficient to decode even wide band signals like WFM, DECT, Wifi and others. The ADC works with 8 bit data width and offers a dynamic range of 48dB. The digitised I/Q data is handled by a Xilinx CPLD and an integrated ARM Cortex processor. Due to the design and component selection the device supports only half-dulplex operation. The entire circuitry is designed for low power consumption, supply is done over USB only. The board has a Micro-B USB socket, a suitable cable is included. To synchronise several HackRF One boards, the system offers connectors for clock input and output. These signals can be used to use multiple boards in parallel, for example for MIMO or full duplex experiments. Two push buttons and several diagnostic LEDs are provided for easy operation. The amplifier block is followed by a low-pass and a high-pass filter, which can be used for either path (input/output). After the filter the signal arrives at an RF mixer RFFC 5072. This mixer can be used up to 6GHz. The signal is mixed up or down, depending on user programming and finally fed to the baseband circuitry. Mixer and filters can be bypassed by further RF switches, allowing the IF signals to be switched directly to the amplifiers or directly to the antenna. As baseband chip a Maxim MAX2837 component is used, which covers a frequency range of 2.3 t o2.7 GHz. The chip uses monolithic filters which provide for a very linear output signal and a low noise figure on receive. The IQ data is then passed to an ADC/DAC chip Maxim MAX5864. This ADC as well as the DAC uses has 8 bit resolution. A maximum sample rate of 20MS/s is supported by these converters. The digital signals are finally passed to a Xilinx XC2C CPLD. The entire system and all interfaces are controlled by a powerful ARM Dual Core Cortex processor (NXP LPC4320). The board further supports 1MB flash memory. Currently (Autumn 2014) the HackRF One board is working with 'SDR-Radio', GNU Radio' and 'SDR#'' (SDR Sharp). Due to the open source and license fee free nature of the project, other software project can join at any time. Several authors already have announced their support for the HackRF One. Up to date information about software is found on the manufacturers Wiki site. 18. Aug. 2014: @uhf_satcom on twitter shows first screenshots of beacon reception an 5.7GHz with teh HackRF One and sdr-radio.com. The SRH-789 is a wide band telescopic antenna for scanners and similiar devices. The adjustable frequency range is from 90 to 1100 MHz, the resonant frequency is set by changing the length of the telescope. Retracted length 20cm, fully extended length 80.5cm. A helpful table for various lengths and frequencies is printed on the loermost element of the antenna. The connector is SMA male, with locking nut, which allows the antenna to be adjusted in any position on the SMA socket. A knuckle helps adjusting the antenna vertically or in any other direction. 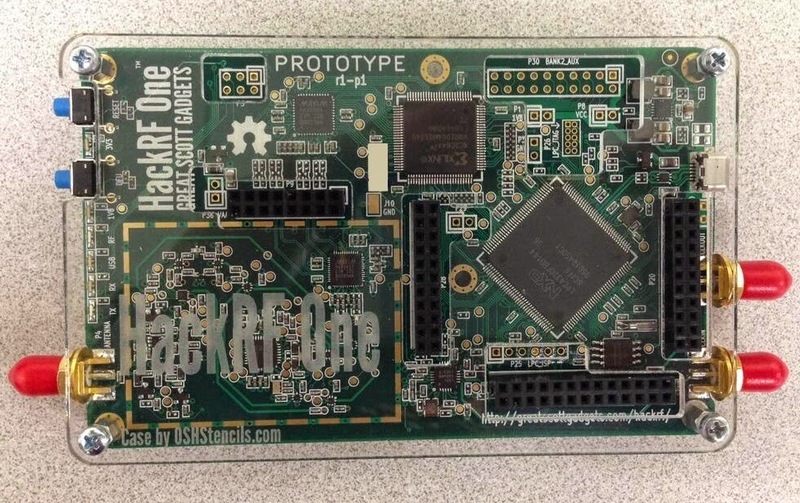 The HackRF One board was shipped in spring 2014 to the Kickstarter sponsors as a prototype. The first production run is scheduled for July/August 2014. We start taking orders now and ship on a first come, first serve basis. Alternatively all schematics, PCB layouts and programs are available for download in open formats for DYI projects.